Hello survivors! I am your professor, Miette Bynny. I will be teaching you important skills for living in a world surrounded by zombies. From a secret government project gone awry to a biological weapon accident, or even something as mundane as a mutated disease infecting the masses one by one, there are many possible causes for the start of a zombie epidemic! You need to be prepared for a very possible future! This class is for both muggles and magic users alike. The class is laid out specifically for each. We will ensure that both of our worlds will persevere against all odds. Newsflash: zombies are undead! This means that they see worlds not necessarily visible to the living - that means you. I consider this possible future to be the true test in defining the strong from the weak. With this course, let us ensure that you will not be in the latter - you will rise from the challenges and gain strength with knowledge... if you pass. But if you fail, if you cannot complete our lessons and assignments before the end of term... well, let us hope you do not end up as an expendable part of my party. As Charles Darwin states, "Only the strong shall survive." This is a half term class, therefore you will have the opportunity to earn 300 points. In order to pass you must have completed at least two homework assignments and the final. This class is worth one quill. Although I would like HW turned in at the end of each month, I will accept any HW up until the due date of the Final. Add all those bad boys up for 300 glorious house points! Homework assignments will/may contain True/False, multiple choice, fill-in-the-blanks, short answers, drawing, graphs, etc, Whatever tickles my fancy. The Extra Credit may be essay/critical thinking/story type questions to see how you would react in a situation of a zombie attack. Remember if you fail, consider yourself one of the fallen. Those that pass will not look back or come back for you, because hey... they want to live. Sept 1st - CLASS IS OPEN!!! All Lessons are up. You can do them all at once (if you want to be all Hermione and all go right ahead). However, if you wanted to do once lesson at a time, they are due at the end of each month, Midnight HOL time.. if you have any questions feel free to contact me. I will also be posting your artwork so make it fun!!! 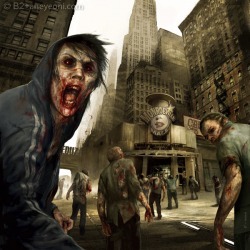 :D WELCOME TO ZOMBIE 101!!!!! I have the Class Roster up! Anyone can view it to see where they are in points! Remember there are class rewards at the end of the term! SHINY AWARDS!!! YEAAAAAAAAAAH! Oh yeah here is the class website :D CLASS ROSTER LINK...CLICKY ME HERE! !